Scott wrote yesterday about the problematic appointment of Ron Binz to the Federal Energy Regulatory Commission. He’s not the only one. 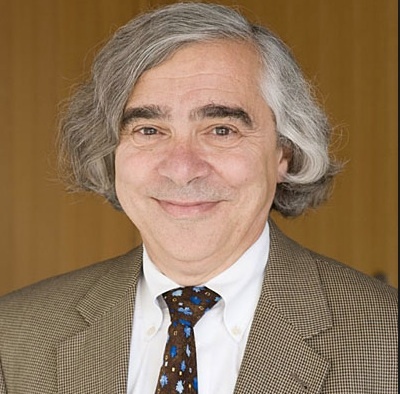 Obama’s new secretary of energy, Ernest Moniz of MIT, has chosen as his chief of staff Kevin Knobloch, who up to now has been the president of the Union of Concerned Scientists (UCS). The UCS leans far to the left, and long ago became a partisan adjunct of the Democratic Party. 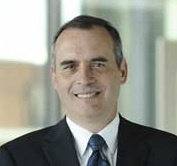 Given that UCS began its organization life chiefly in opposition to nuclear weapons and nuclear power, it seems an ill omen that Knobloch will have such a senior position in the government agency that oversees all things nuclear in America. That nuclear renaissance we keep hearing about? I’d be skeptical the Obama Administration is going to push it. Take the story about EPA’s research into the toxicity of mercury. At the same time that the White House was proposing a weak rule to clean up mercury from power-plant emissions and had crippled the new-source review program that required power plants to have state-of-the-art pollution cleanup equipment, EPA was preparing to release a study showing that 8 percent of women of childbearing age had sufficient mercury in their bloodstream to harm their as-yet-unborn children should they become pregnant. And before EPA could release that study, the Office of Management and Budget said, “Excuse me, but we need to review that,” and then the study disappeared. They sat on it for months on end, and it was only when someone at EPA leaked that research to The Wall Street Journal that it saw the light of day. This statement was wrong from start to finish, including “and” and “the,” as Mary McCarthy might have put it. First of all, Bush didn’t “cripple” New Source Review. But that’s a long and very wonky story; if you are a glutton for punishment, you can see my long papers about NSR here and here. But perhaps it suffices to note that the Obama EPA has not returned to the Pre-Bush NSR regime, which shows how this was merely a Bush-bashing talking point. Much more deceptive and inaccurate was Knobloch’s second point here about mercury. The impression he gives is that the Bush White House was suppressing for many months data showing that 8 percent of women of childbearing age had high levels of mercury in their blood. That data had already been published months before by the Centers for Disease Control. In fact, it was the CDC data that the EPA was going to republish in its own report. There was no suppression taking place at all, except in the paranoid minds of the UCS, which seemed unaware of the CDC report (the bi-annual National Report on Human Exposure to Environmental Chemicals) where these data are published. But he further misstated the CDC data. The CDC report did not say that 8 percent of childbearing women had mercury levels high enough to harm their unborn children. In fact, the EPA did not identify a single woman with blood mercury levels above the EPA’s lowest level of harm from mercury. Rather, they found 8 percent of women with blood levels above the EPA’s “reference dose,” which is set ten times lower than the lowest dose the EPA believes will cause health risk. The EPA and other health agencies set the “reference dose” ten times lower that the identified dose for real risk partly to account for uncertainty, and partly as a regulatory tripwire, especially if the trends are adverse over time. The actual data from the CDC is displayed in the first figure below, which shows the distribution of mercury levels by percentile. Unfortunately because of the usual privacy protocols we don’t know who the 8 percent of women were who came in above the reference dose, where they live, or what might have been the source of their mercury levels. Remember Knobloch’s bit about how the evil Bushoisie was “weakening” mercury regulations? 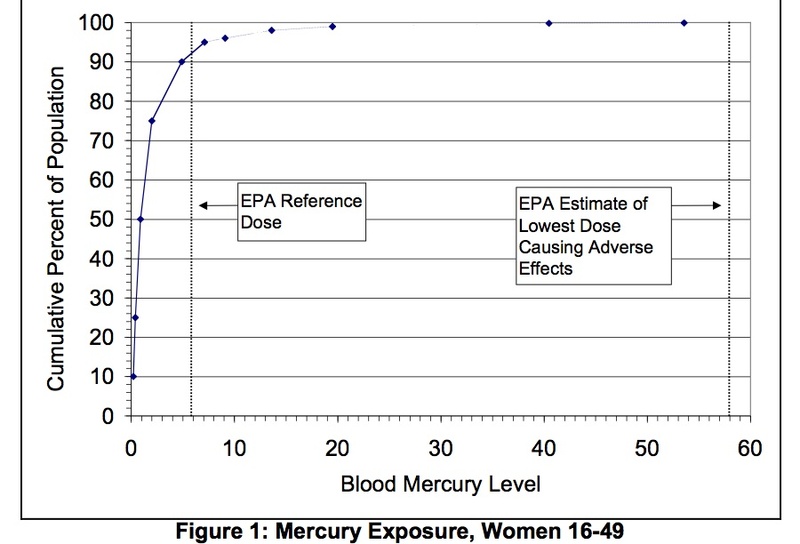 Not only have mercury levels consistently fallen according to EPA data, but subsequent CDC screenings have found no women—none—above the .95 percentile of the reference dose. 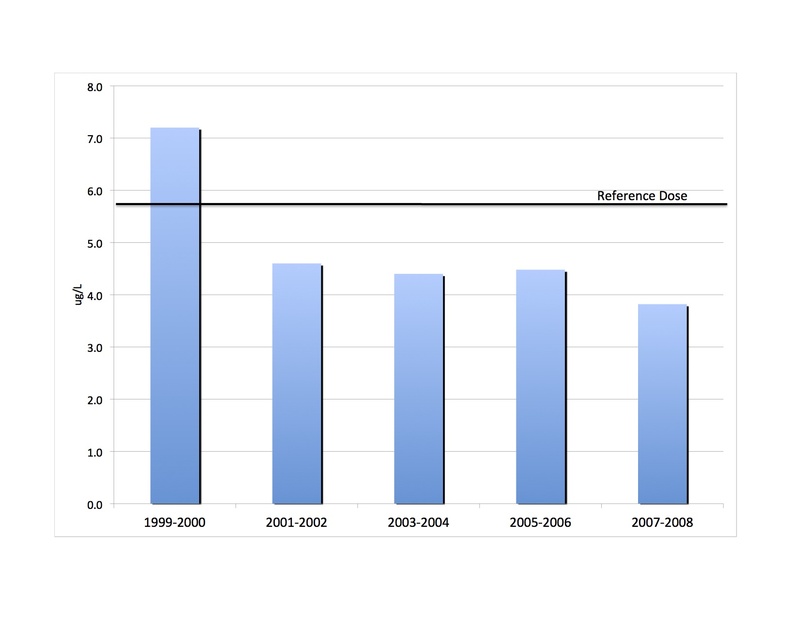 This trend is displayed in the second figure here. No wonder the UCS report on Bush is no longer on their website. Talk about an epic fail. After I presented the foregoing in a press conference at the National Press Club in 2004, the UCS more or less dropped the subject. It was clear the report was intended as a political hit on Bush in an election year, just as during election years environmentalists and their media toadies “discovered” that Texas had the nation’s worst smog under/because of Bush—a thoroughly risible charge. By the way, today the EPA is looking high and low for elevated levels of mercury to worry about. Right now the group they single out for special attention is: Laotian subsistence fishers. I’m not making this up. As Glenn Reynolds likes to say, the country’s in the very best of hands. Unfortunately, for a staff position, Knobloch doesn’t have to be confirmed by the Senate, or ever face committee hearing questions. Too bad.